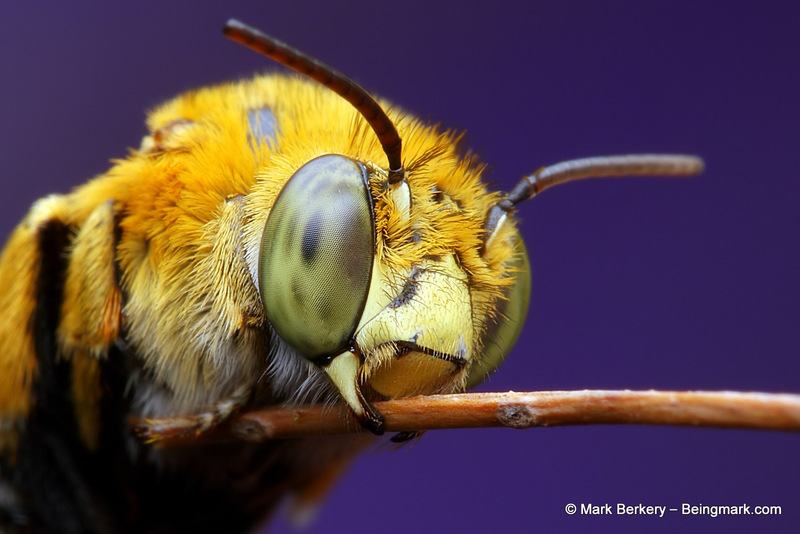 This is beautiful, who knew bees have so much character! The lively intelligence of our garden sprites. I liked the close-up shots. They are nice, and a great little model too. Wow!!! The colors you chose for the background are amazing! 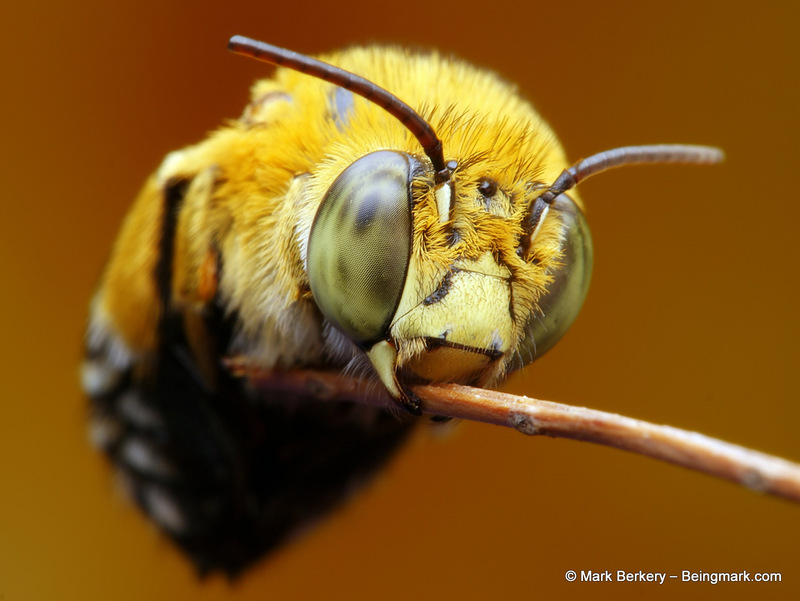 Totally make the bee’s color pop! Good job!! I thought it worked ok too. How big are they and where are they found please? It is a beauty, isn’t it. Nature is … Thanks Assima. I am just so curious how you get SUCH beautiful pics of things that are SO mis-understood. You are right Elle, if we don’t learn to respect the nature we – ‘have dominion over’ – responsibility for we are doomed. Fear is eroded by first facing the object of fear. Then having seen the falsity of it – fear dies – give it up, to the simple sensation inside. This is my take on macro – https://beingmark.com/macro-illustrated/ – If you have any questions about it ask on that thread and I’ll answer the best I can. I am terrified of bees, but they are just like the spiders. Unique in there own way. I have a certain respect for these beautiful animals that aide us in living. Actually very good & clever photography. I’m very afraid of bees. But these photos are absolutely gorgeous. I’ve never found them so beautiful. Bees are generally harmless. It’s the social bees that can be aggressive in defense of the hive, because the individual is expendable. Hi Diksha. I don’t see anything there. You’ll work it out, it just takes time and some effort. You’re welcome. I’m new here. Things are different close up, where the illusion of mind has little sway. I’m not sure if I missed this, but what lens was used? I am a macro photography obsessed wildlife biologist/nature nerd who has been dying to get my hands on a new lens for my D3300 so this is right up my alley. 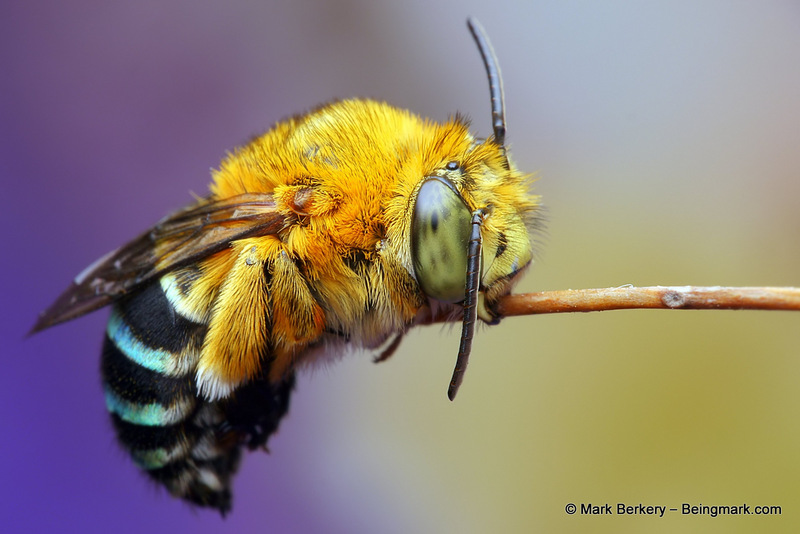 Stunning fuzzy bee! My lens wouldn’t fit your Canon/Nikon, being m4/3 + achromat. Just get the standard macro lens for your make, to start. The lighting is the first thing anyway, get that right and you’re away. My rundown on macro here – https://beingmark.com/macro-illustrated/ – might help. Others do it their way. 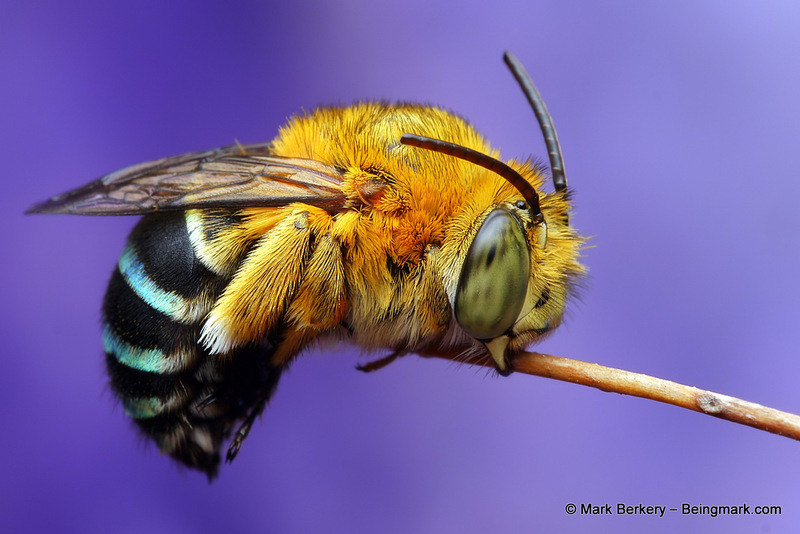 I’ve never seen a blue-banded bee before. I always discover something new on your blog. I’m posting them throughout the year. They are that. Thanks Hidayah. It’s such a bizarre and beautiful creature! Indeed, our bizarre nature is beautiful – has no negativity in it. They are that, amazing little earth engines. Representing the magical genius they come from … that upholds the earth and all its ways and things. The bee was being a bee, holding on to the roost, registering the flash of light and the vibration of touch, the smell of strange. 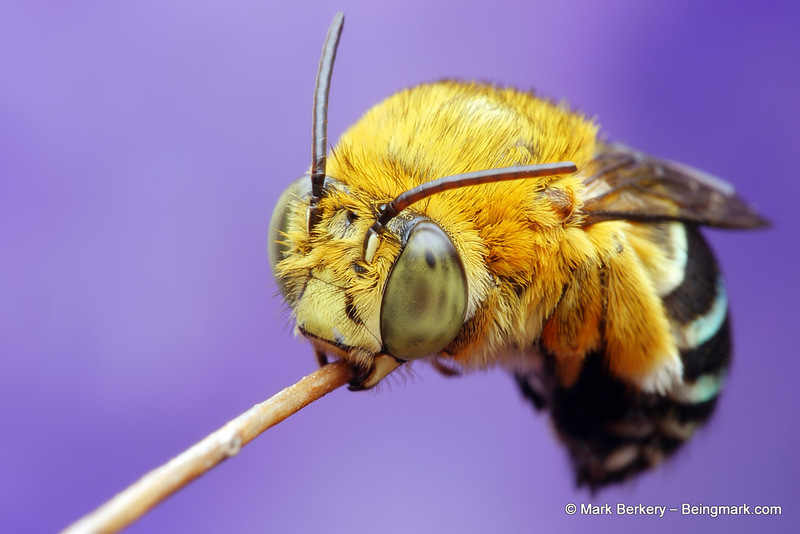 Bees are not burdened with thinking as we know it. 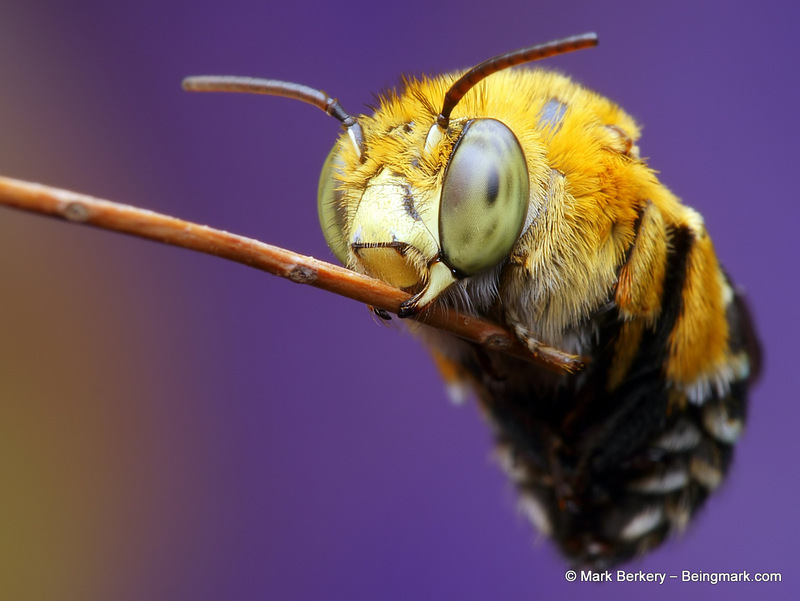 I really admire how your photos go beyond being technically brilliant, which they awesomely are, and get to the soul of the insect and lead us to care about it as an individual. It’s something I love to do, re-present the forms of nature at my feet in such a way as to capture something of the invisible behind. Beauty is a place all creatures come out of or through, and in taking form retain something of origins. All it takes is to see it to express or render it, in some medium. I don’t think many of us reach such profound awareness but we can try to be more open. Thank you. It’s my experience such ‘profundity’ is often masked only by thinking ‘I can’t’. But it’s a long road, and being open is a big step, even ‘profound’. Without Pollination of bees , They buzz off humanity stands no chance oppose pesticides and herbicides many countries are recognizing this . Most recently France was first country to banned all spraying chemicals. Where does the Blue Banded Bee reside Krista ? Yes, shame about the destructive pesticides. They are only necessary for ‘industrial’ farming but also get used in the garden. Another lesson still to be learned by Man – don’t do what doesn’t need doing. Yes they are. Thanks Natasha. Incredible …..the detail of the insects are amazing!! I love the leaf cutter bees .. are these the same type that dwell in Victoria, BC? I only see a blur when they zip by. Thanks!! 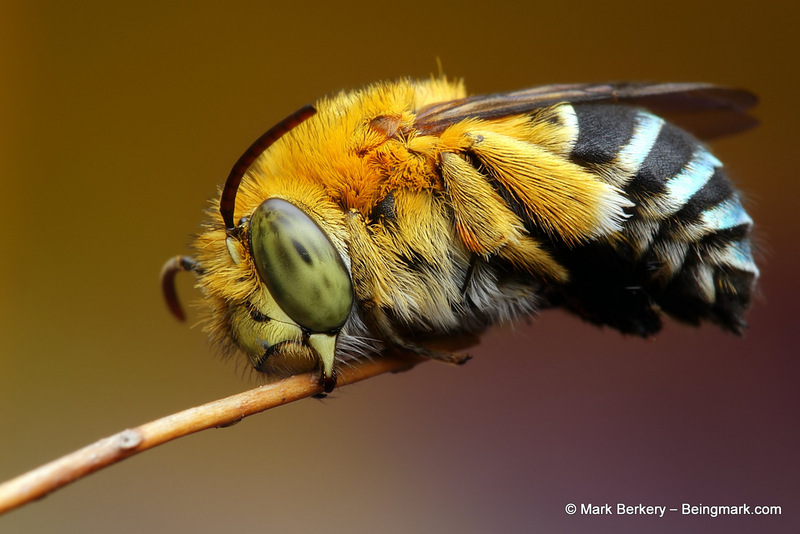 Yes, the Blue Banded Bee is in Vic too. And they are fast, zipping around the garden and chasing each other as if in play – very fast and agile flyers. These like to make their nests in clay, often at the base of an established plant that provides raised cover from the elements and makes it easy to tunnel amongst the roots. The Leaf Cutter is more likely to make a nest in a hollow of a certain size, like a bamboo or similar – rose leaves being a favourite material to line and seal with. I know they are nesting in our yard, I caught a nano-second glimpse of one cutting a section of leaf! So fast, glad I didn’t blink. I see lots of the half circle cuts and only ever one sighting! I noticed 2 bees zipping into the ground beneath some sections of sidewalk in the backyard .. I tried to get a photo of them, but just got a blur! There were 2 of them about a few feet apart. I thought they were leafcutters, but really don’t know. I learned a lot about the varieties of bees when volunteering at Fort Rodd Hill. Honestly, I didn’t know very much about bees and quickly learned more. Now I have the book “Bees, Wasps, and Ants” by Eric Grissel, lots of photos, information. I’ll have this with me now in the garden .. always! Last summer I saw my first “digger bees” .. now that was fascinating to see them dig around in the sandy soil and finally choosing the perfect location (for nesting???) thank you for your amazing photos!! Aha .. bamboo!! We have lots of bamboo plants and a great supply of the stakes! A few years ago I happened to see a bee enter a hollow stake!! So this year I have left the cut bamboo stakes alone (used for staking peas and beans) … if I do cut some of them up .. when would be the best time to do this, so that I don’t disturb any baby bees? Thanks! Yes, it’s a pleasure to watch the various creatures come and go in the garden. And it sounds like you have a great garden with much habitat for the little ones. I would leave any work on their nest sites until they stop laying or coming and going, so you don’t interrupt their cycle. If you move things just be mindful of surrounds, shelter from the rain and wind, positioned for catching the morning sun, and such … Try things out, google it too. I have various nest types and sites in the garden and under the house, clay bricks drilled for anything that wants it – usually blue banded bees but other creatures take advantage, wooden posts drilled for the orange tail resin bee – again other creatures move in, to new and used nest sites – and various other bees and wasps. Dried out sunflower stalks work for a while, cut to lengths and tied in bundles and hung up sheltered from the rain. All sorts of things make habitat for small creatures. These pictures are so interesting. 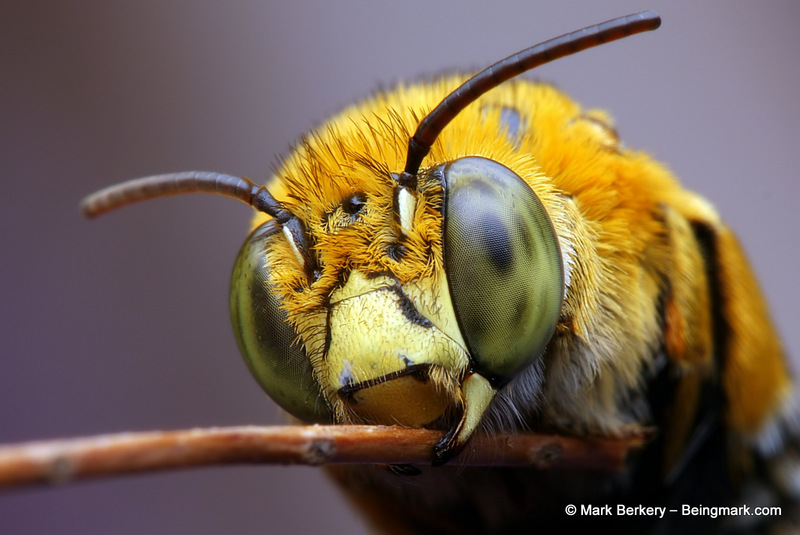 We spend so much time getting mad at bees, but this one, as you say, is a little beauty! I’ve never been mad at bees, wary of them yes. Most bees are harmless, as long as they are handled carefully. Some social bees, which are the few of the many kinds of bee, have a reputation for aggression but they are just defensive, maybe a little touchy about it at times. They do love clover, the honey bee. And they sting more easily than others. Not their fault though, they can’t read our nature or intention. One Orange Tail Resin Bee stung me and I was only helping her up off the ground where the ants would get her. I still help them out of the water when they fall in. Yes, it is. They are little beauties. They must be nesting near your garden so you might find them roosting at night on a thin stalk in some sheltered spot. Careful not to bump them. They are truly beautiful. Thank you for allowing us to see them up close. They move so fast, so I find them very hard to photograph. They are hard to photograph up close during active hours, but after dark, if you know where they roost, it’s easy enough with the right gear and attitude. You have to be careful not to wake them though. For my rundown on macro – https://beingmark.com/macro-illustrated/ – you might enjoy. Thank you. I will check out your macro tips. And go spot-lighting in my garden at night. Thanks Frankie. She is a beauty. Thanks very nice detail is very useful. Thanks Gyan. Detail is sweetness to the eye that sees. Great pictures, outstanding photography, You really captured the majestic quality for one of God creations. My hat off to you sir. Thanks Brian. They are amazing little creatures, and just one of the many servants of Earth that keep the place functional and bright with flowers and food. We are lucky to have such a beautiful nature. Thanks Bharat. Little beauties all right. I have never quite seen such beautifully detailed macro photography.. you must have mad skills and most importantly patience. Keep up the great work! Thanks Sukanya. I would say I have a fundamental love of nature and the will to express it. Macro is the medium that came my way. This is remarkable. It is like you have merged macro photography and fashion photography. Stunning. In fact nature is inspiration for much else in our man made world. 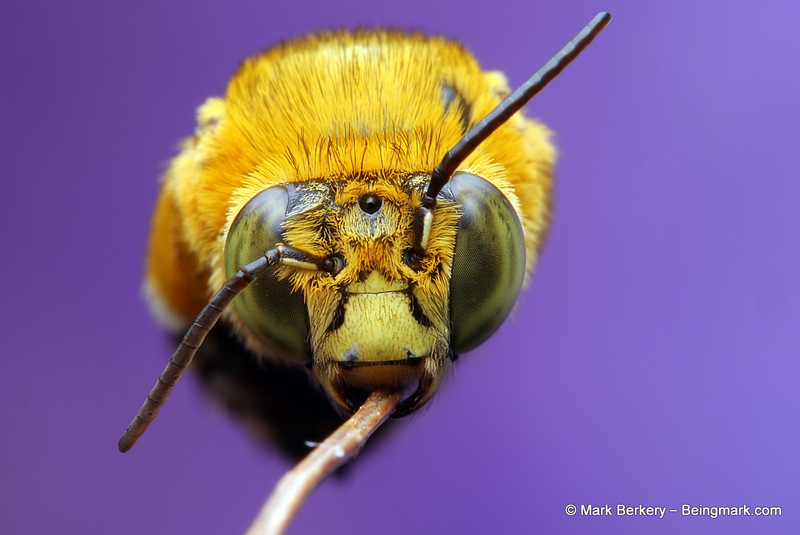 Mark, I’ve never seen any bee photography in such great detail. I’m in awe. Wow! It’s amazing to behold its beauty this close. I enjoy watching its fine lines and features, and natural color combination. Thanks for these beautiful photos. I must Share this. It is, isn’t it … an amazing little thing, such finely sculpted creatures of impeccable nature performing an indispensable function, beautifully. Nice close ups – I like you can see all the different parts of the eyes so clearly. Yes, the detail attracts the eye that is made to see it. Incredible work, as always, Mark. Congratulations on your Discover feature! Well deserved. Easier than when she’s awake, sweet little thing. Yes, all is well, just painting a picture for those who would. They are beauties all right.